For those of you who have been following this blog for the past two years, you’ve read about the many … many … many walks I go on. While I do love walking and exploring the Amalfi Coast on foot, there are times when it is inconvenient—or downright exhausting—having my own two feet and the public SITA buses as my only sources of transportation. I really don’t like (and that’s putting it politely) driving manual transmission cars, and my driving lessons on the Amalfi Coast have been less than successful. My life changed dramatically a week ago when we bought … a motorino! 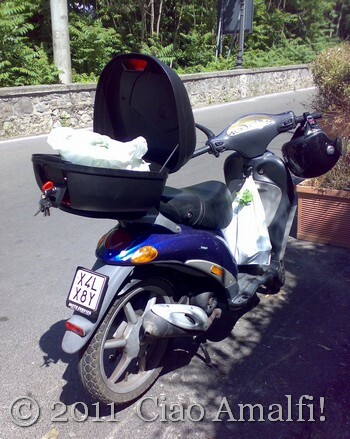 (That’s Italian for scooter.) And could it have a more appropriate name than a Piaggio Liberty? I love it! I’m still getting used to riding it, especially in all the curves on the Amalfi Coast. Even though I haven’t ventured very far yet, I am slowing starting to realize just how much this little motorino is going to change my life here. 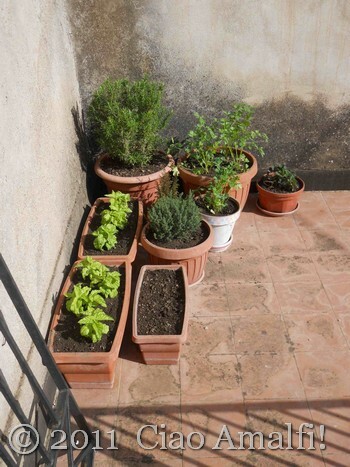 Yesterday was a beautiful day, and I have been wanting to get the summer herbs planted on the terrace for the past week. There is a truck that sets up every Sunday morning during the warm weather months at the crossroads of Ravello and Scala that sells plants, flowers and herbs. While I could have walked there and back like I did last year, it was such an amazing feeling to just hop on the scooter and be there in a few minutes. 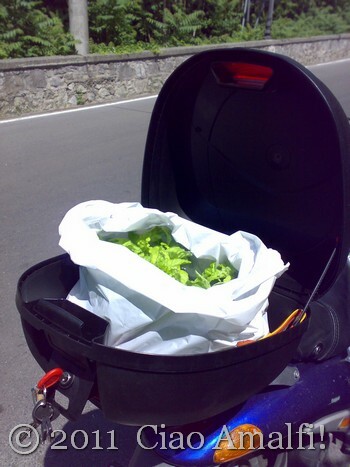 I just needed basilico (basil) and prezzemolo (parsley), and the men selling plants were nice enough to bag them up so that I could easily get them home on the scooter. 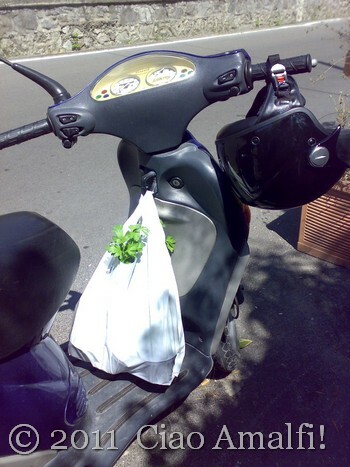 I put the bag of parsley plants on the hook at the front of the motorino, and the bag of little basil plants fit perfectly inside the bauletto … the little storage container behind the seat. This is the best use I’ve made of the bauletto so far! The best part was that by taking the scooter I had plenty of energy left when I got home to get all the herbs planted for the summer on the terrace. The parsley and basil plants are new, and along with them I also have a rosemarino (rosemary) plant that is a few years old, a timo (thyme) plant from two years ago and a wild strawberry plant that was a gift last summer that I hope survived the winter. (The empty pot below has cilantro seeds!) I can already imagine the taste of the fresh basilico and prezzemolo on the summer pastas and fresh tomatoes. I’m hoping for a great summer like last year when we fabulous basil all summer long. The photos of the motorino were taken on my phone, but they’re the first pictures I’ve taken of my new Liberty. Well, new to me! It’s quite old, but it runs well and the price was perfect. It’s a bit dirty at the moment from the rain at the end of last week, but I’ll get some proper pictures soon when it is all clean. 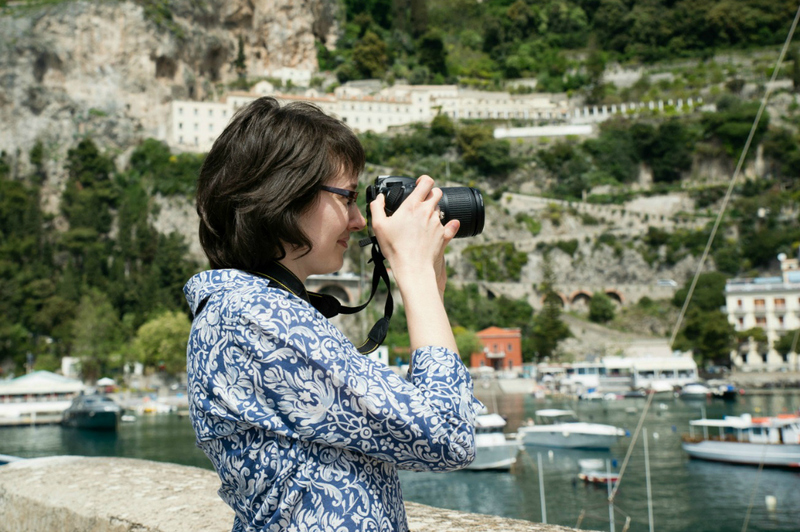 I just couldn’t wait to share my first taste of liberty … and it tastes like summer on the Amalfi Coast! Last weekend the new Marina cruise ship from Oceania was in Amalfi, and while walking along the harbor I caught this image. 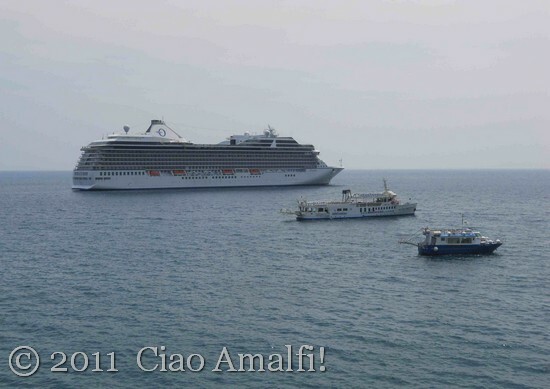 The tiny boat named Stenella, the medium size Sorrento Mini Cruise and the extra large Marina cruise ship all lined up perfectly by size. It only lasted a couple of minutes before they were all facing different directions again, but it made me smile to see the different sized boats that come into the Amalfi harbor so neatly organized. Happy weekend wishes!! 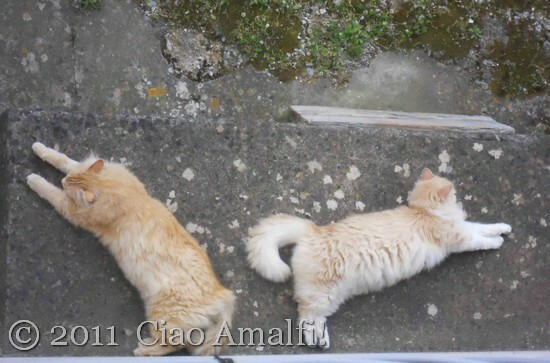 The temperatures have been warming up during the day on the Amalfi Coast, but it’s still cool enough in the evenings that our long haired cats haven’t started shedding their winter coats yet. The other day I opened the window to look for them, and this is what I found directly below the window. I’m guessing that they were taking advantage of the cement in the shade to cool off. That or they were trying to impress me with their new installation art project. (Or would this be land art?) The curve of the tail is a nice touch, don’t you think? Very expressive. I think Puffy could take a few lessons from his mother on the right. Animals are always good for smile! While sitting and waiting for the Tour Guide to fit his car into a remarkable small space near Positano, I was looking at this old stone mile marker on the side of the road. I don’t normally see photos in bianco e nero, but the combination of the worn lettering of the sign, the old Mini Cooper and the bright red sign meaning “don’t honk your horn” just seemed more appropriate in black and white. I’m not sure I had noticed these mile markers before, since you don’t see them like this much past Conca dei Marini. Sometimes it’s handy going everywhere with a Tour Guide, and he told me it is called a pietra miliare in Italian. The term refers back to the carved stone markers the ancient Romans put up when they built their roads. This pietra miliare certainly isn’t going to last that long, but it was a fun way to learn a new term in Italian. 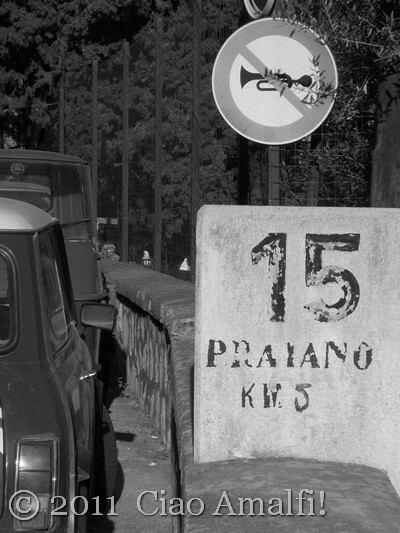 We assumed that the 15 marked the numbers of kilometers from the beginning of the Amalfi Coast Road SS 163, and then we guessed that it was another 5 KM to Praiano. Perhaps someone in the Positano or Praiano area can confirm this? Wishing you a happy weekend! 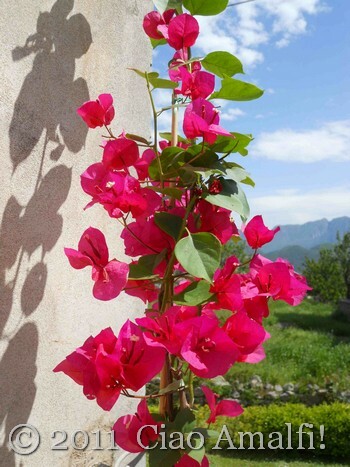 On Monday, I mentioned that the bougainvillea in Positano was already blooming and shared a photo of a bright pink variety that I love. 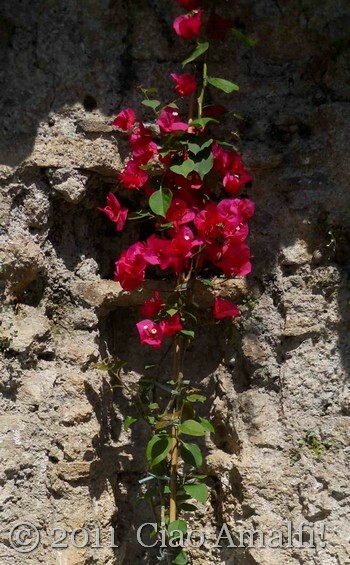 It so happens that this is also the Tour Guide’s favorite color of bougainvillea, and he was the one who first pointed out to me how beautiful it is on Capri and in Positano. Well, here’s the story of what happens if you leave me alone for awhile in Positano. 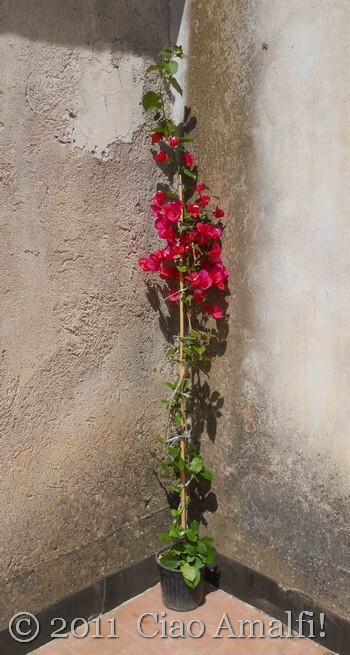 You end up with a bougainvillea plant! While the Tour Guide was working, I wandered up the streets of Positano just enjoying the warm weather and being in Positano in the evening for the first time. I noticed a little florist shop across the street and crossed over just to have a look at the flowers. Now we just had to decide where to put it. Two years ago we bought a bougainvillea plant that ended up being a big disappointment. The color of the flowers ended up being this weird orange color that I’ve never seen anywhere else, and I’ve learned since that I didn’t make the best decision in where I planted it. So this time after a bit more research, we decided to place it in this old stone well in the garden. I can’t plant it in the central area of the well, because it actually still holds water. I learned that a few winters ago when the lavender I planted in there drowned during an especially rainy season. So now I just fill the well area with colorful annuals that I don’t have to worry about over the winter. There’s a ledge above the well at the back where I’m going to place the bougainvillea once I find a terra cotta pot to plant it in. There’s plenty of sun in this spot, and the other bougainvillea we have in the garden is very happy potted rather than in the soil. I think it will look lovely with its pink flowers filling the area around the well as it grows. I have a lot of work to do cleaning the weeds that have grown on the walls around the well over the winter, but now I have a very good reason. 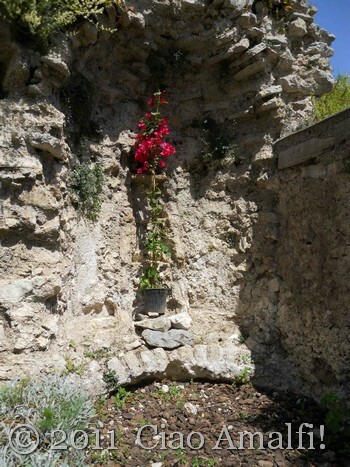 And I hope to find some pretty pink and white flowers to fill the well this summer, too. I’ll share a photo when the redesigning of the stone well is complete. I hope we’ll have bright blooms each May to celebrate the Tour Guide’s birthday with a smile!